There’s nothing like getting paid for doing nothing. Sure Stefan Struve (pictured) and Matt Mitrone would have preferred to fight each other Saturday at UFC 175, but leaving Las Vegas with your show and win money isn’t a bad consolation prize. Just minutes before the heavyweights were to take center stage, Struve, who was returning from a 14-month hiatus after undergoing surgery to correct a leaking aortic value and an enlarged heart, was hyperventilating backstage and fainted. The scrap was immediately scrapped and Struve was rushed to the hospital. 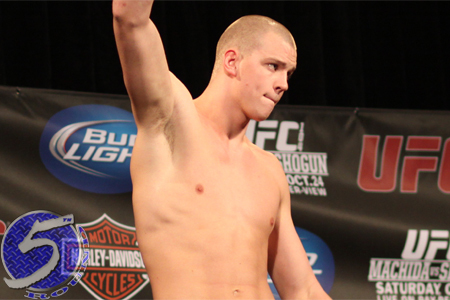 The UFC later revealed Struve was released from the hospital with a clean bill of health. Speaking of bill, Struve and Mitrione still need to cover their bills after months of training for their fight. In steps UFC president Dana White, and unbeknownst to him, UFC co-owner Lorenzo Fertitta. “We’ll take care of them,” White said during Saturday’s media scrum of paying Struve and Mitrione. “I’m pretty sure we’re going to given them their show and win [money]. I’m not 100 percent – I didn’t talk to Lorenzo about it tonight, we usually talk about that type of s*** before I talk about it – but as far as I’m concerned, sitting right here right now – now Lorenzo has to do it – we’ll pay them both [their show and win money].